A bride’s gotta look her best self on her D-day - that’s a given. After all, it’s one of the most defining moments of her life and she has got to own it. With the outfit and jewellry decided, it’s the bridal makeup that makes or breaks the bridal look. That being said, you need to pick the best Makeup artist if you don’t plan on DIY-ing it. Because, in this age of high-definition photography where every angle of your face is captured in stunning detail (thanks candid photography) the makeup obv can’t go wrong! 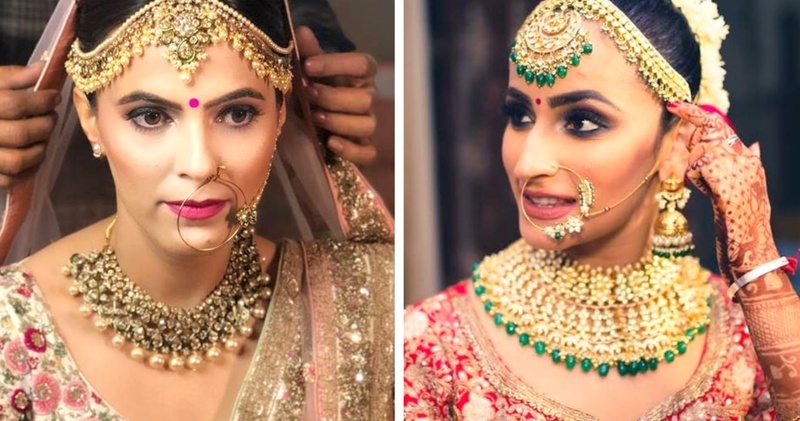 The Makeup artist under our radar today is Tripti Rastogi and I can’t get over her bridal makeovers. A bride’s makeup on her D-day is of paramount importance and this talented makeup artist based out of Delhi, couldn’t agree more. Armed with her years of experience, Tripti has some of the best names in the field to back her up. For her, it is the joy her work brings on her client’s faces and the confidence they place in her work, which mean the world to her! I am in love with this bride’s day makeup look. This one’s always tricky, as it’s important to not look too overdone but also look like you are the bride and Tripti has done a great job at it. Although, the best part of this look lies in the details. If you look closely, Tripti has given this bride a soft-smokey eye look with a dash of pink on her waterline, which makes all the difference. I am in love with Tripti’s all red makeup look. It’s a subtle base with dark smokey eyes and perfectly contoured cheeks. It’s a standout look especially if your ensemble is heavily embroidered, brightly coloured or if you’re wearing heavy jewellery. If you are looking to go full out, then this is the way to it. Love how Tripti has kept the whole look glamorous yet sophisticated with a subtle makeup base while accentuating the eyes and lips. Also, kudos to those gold and black smokey eyes! If you are gearing up for a daytime celebration this look is all what you should aim for. She has given this bride a flawless waterproof base with a generous brush of highlighter on her cheekbones, courtesy a gentle blush and completed it with a coral lip color! This airbrushed makeup look by Tripti deserves special mention. I am totally going gaga over her subtle base, the perfectly done base and glittery eyes. So, brides-to-be out there, I’m sure you have one more makeup artist’s name in your shortlisted list now! Image Source - Tripti Rastogi unless specified.